June Lake lies two miles from the south junction of U.S. Highway 395 with California State Route 158. The view from the end of the lake at "Oh! Ridge" is most photogenic, and the subject of thousands of snapshots. At the other end of the lake lies the main village and business district of the community of June Lake, California. Often described as "quaint," downtown June Lake offers a number of lodges, shops, restaurants and taverns. The lake itself is approximately one mile long and a half mile wide, and is served by two marinas, where you may rent a fishing boat or launch your own. June Lake can also be ideal for paddling or sailing. At the northeast end is a swimming beach, popular in the Summer months, and there are campgrounds and RV parks surrounding the lake as well as in town. If you have never before taken the side trip off of Highway 395, you will be pleasantly surprised, and will probably return again and again. Gull Lake is the second in the chain of four mountain lakes comprising the June Lake Loop, and the smallest in size. The downtown community and main business district of June Lake, California is situated primarily between June Lake and Gull Lake, with many properties and sites offering a commanding view. The shores of Gull Lake host a boat landing, a community park and center with playground and tennis courts, several summer homes, the Interlaken condominium complex, and a campground, which arguably features the best campsites anywhere in the area. The "Fisherman Trail" and the Gull Lake Trail encircle the lake, connecting the June Lake Village with the campground entrance and the Gull Meadows walk-on boat loading dock. Gull Lake is a favorite of many fisherman, as it consistently yields good-sized trout. A healthy population of crayfish and a few small Sacramento perch reside in the lake as well. Silver Lake is nestled deep within the heart of the Sierra Nevada at the base of Carson Peak, just below the confluence of Reversed Creek with Rush Creek. California Route 158 traverses along the western shore, while a row of fine summer homes and cabins lies across the lake to the east. 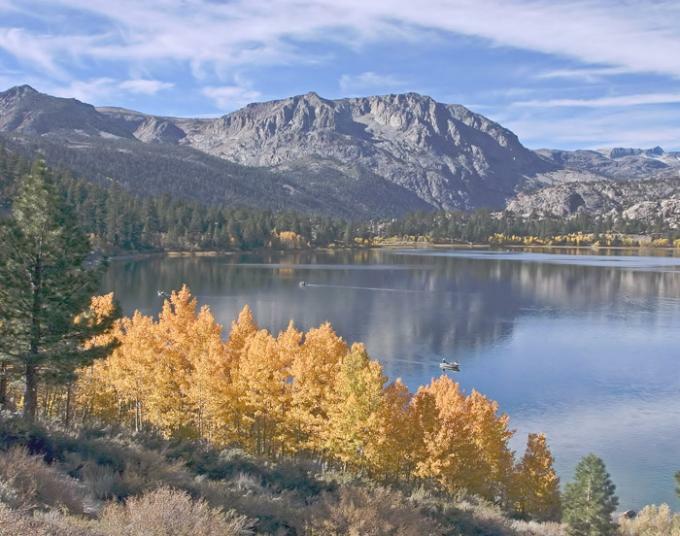 Silver Lake is also home to one of the Sierra's oldest fishing and vacation resorts. The Silver Lake Resort was originally known as "Carson's Camp," and has been famous for quality mountain recreation since 1916. The Rush Creek Trailhead is located near the resort at the north end of the lake, providing trail access to the Rush Creek Basin, The Ansel Adams Wilderness and Yosemite National Park. The Rush Creek Trail interconnects with the Pacific Crest Trail system and the John Muir Trail, and the local backcountry is fabulous. At the trailhead, the Frontier Pack Station is on hand to provide horses and mules, with packages ranging from local day rides to extended pack trips into the wilderness. Grant Lake is by far the largest of the four lakes on the June Lake Loop, although, as a reservior on the Los Angeles Acqueduct system, its level can vary. The 12,000 foot elevations of the summit of Mt Wood loom just above, as do the lush aspen groves of Parker Bench and the rugged Aerie Crag on the north side of Reversed Peak, but the lakeshore and immediate surroundings are themselves are contrastingly somewhat more barren in appearance, with the sagebrush scrub being the predominant vegetation, and a few trees including the ones that have been planted in the campgrounds. On the lake itself, a 10 m.p.h. speed limit is imposed until 10:00 a.m. each day, to accomodate the early morning fishermen. Grant Lake has long been known as the "home of the German Brown." After 10:00, speedier watercraft may take to the lake, and sports such as waterskiing, wakeboarding and jet-skiing may be enjoyed. Most of the shoreline is accessible to the public by unpaved roads that connect to both California Route 158 and U.S. 395. Surrounding lands are administered by the USDA Forest Service and the Los Angeles Department of Water & Power. There is an absence of private development here, aside from the Marina and Campground facilities, and there are no power or telephone lines. Your visit to Grant Lake will reveal a fabulous summer watersports playground, as well as one of the Sierra's premier trout fishing retreats. Services are available in the communities of June Lake and Lee Vining, each of which is less than ten miles away.